Add high-speed Wireless-N connectivity to a desktop or laptop system through USB - The USB150WN1X1W USB Wireless Network Adapter lets you add high-speed Wireless-N connectivity to a desktop or laptop system through USB. Using a 1T1R (1 Transmitter/1 Receiver) design over the 2.4GHz frequency, the USB Wi-Fi adapter is capable of data transfer rates up to 150Mbps over an 802.11n network. The adapter uses a small form factor design that makes it conveniently portable and unobtrusive, when connected to a computer - it can even be left connected your laptop when in a carrying bag, without worry of damaging the adapter or the host port. 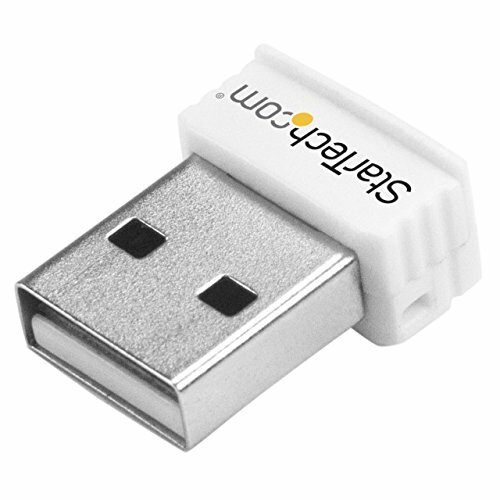 Backward compatible with 802.11b/g networks (11/54Mbps), this USB wireless adapter is a versatile wireless networking solution, offering support for security options such as WEP, WPA or WPA2, as well as wireless Quality of Service (QoS) support and quick device connection through Wireless Protected Setup (WPS). Backed by a StarTech.com 2-year warranty and free lifetime technical support.